Is your bathroom lacking in character and in desperate need of renovation? Luckily, there are affordable bathroom hacks you can use, regardless of the size of your budget! From elegant wall fixtures to convenient ventilation options, there are many things you can do to help reinvent your bathroom without breaking the bank. Read on to discover these affordable ways to give your bathroom a well-needed facelift. Illuminated mirrors can give your bathroom a luxurious feel, without needing to spend a fortune. Not only are these mirrors sleek and pleasing on the eye, but many of them have anti-fog features. Others can act as a cabinet, allowing users to get the most for their money. Arguably the greatest thing about installing a bathroom mirror with lights is that they provide a warming glow and can completely rejuvenate your bathroom’s aura. Mirrors of this kind can be mounted both horizontally and vertically, making them adaptable for almost any bathroom setting. One of the most cost-effective and bold changes you can make is investing in a stylish shower curtain. Many items of this kind can be the perfect addition to a bathroom with a bold color scheme. If bold isn’t your aesthetic, a wide range of designs are available to fit any bathroom design. Showers curtains are considerably cheaper than shower doors, as well as being easier to install and offering greater versatility in regard to design. Sometimes the slightest changes can make the biggest differences. By changing the handles on your bathroom doors and cabinets, you can give your room a glossy finish. Chrome handles are chic and very inexpensive, offering consumers a contemporary design. With materials which can stand the test of time, these options provide real value for your money. Without proper ventilation, your bathroom could become prone to mold and damp areas. Depending on the amount of mold in your bathroom, you may require professional help to get rid of it, as it can be too tricky to remove by yourself. By purchasing a ventilation fan, you can avoid this build-up and cut the costs of professional mold removal services. A fan like this can cost two figures, which is a small price to pay to keep damp corners and mold at bay. It’s important to remember that when you purchase a fan, it needs regular cleaning to allow it to work to its maximum potential. Color is arguably the most important factor behind any bathroom decor. 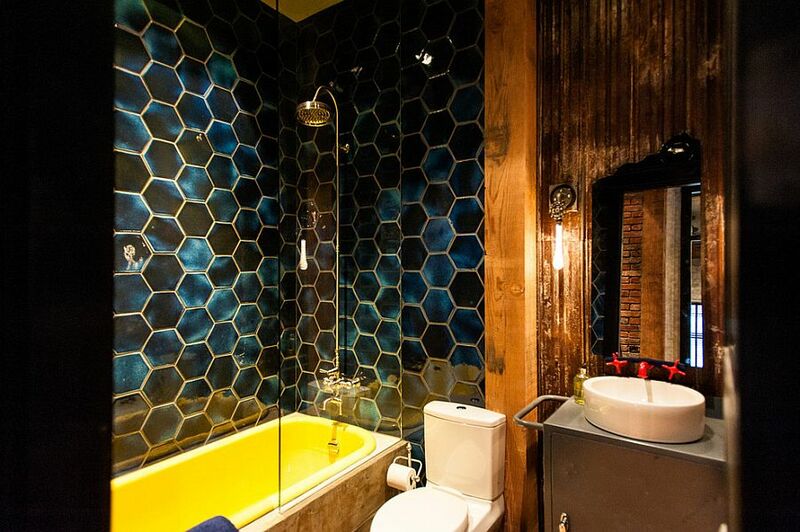 There is bathroom color scheme ideas out there to suit everybody’s requirements. If you haven’t changed things up in a while, consider going with a bold color scheme that’ll bring the most out of your bathroom furniture. Two-tone walls, in particular, are a smart method of giving your bathroom a more distinctive look. This is because they can make small spaces look larger and give the room character. White is the ideal color for a clean, crisp look. You’ll have to keep on top of your cleaning chores regularly to make sure your walls and fixtures don’t become discolored and worn. With a bit of initiative, you can update your bathroom furniture by applying a lick of paint yourself, boosting those that look particularly weathered or aged. A bold colored paint can bring a piece of bathroom furniture to life and create a standout feature in the room. If you don’t want to get your hands dirty, switch up your plain furniture for brightly colored equivalents that fit your bathroom’s new design. By using these affordable bathroom hacks, you’re bound to save plenty on your bathroom renovation, so you can bathe in luxury!